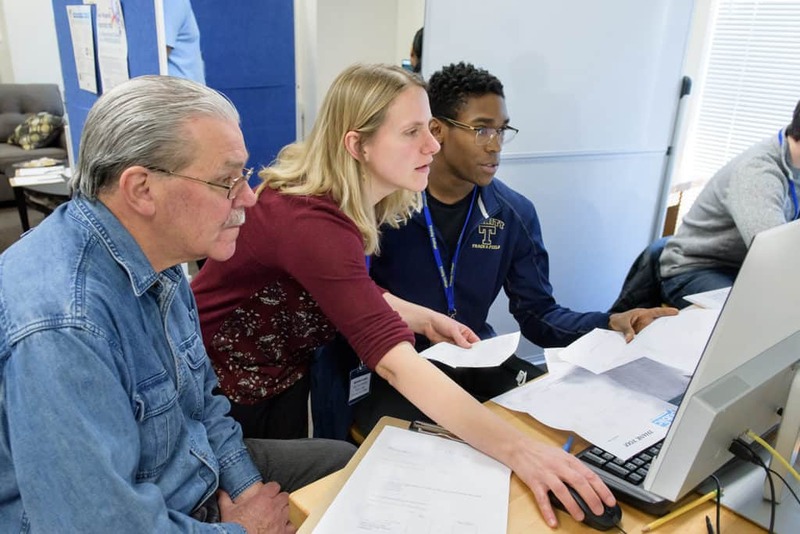 A new pilot program hosted at Trinfo.Cafe is training Trinity College students in Volunteer Income Tax Assistance (VITA) to assist in preparing both federal and state income tax returns for Hartford residents at no cost. The tax clinic is one of several VITA locations in Hartford coordinated by United Way and The Village for Children and Families. Generally, VITA serves those who make less than $55,000 a year, persons with disabilities, and taxpayers who speak limited English. 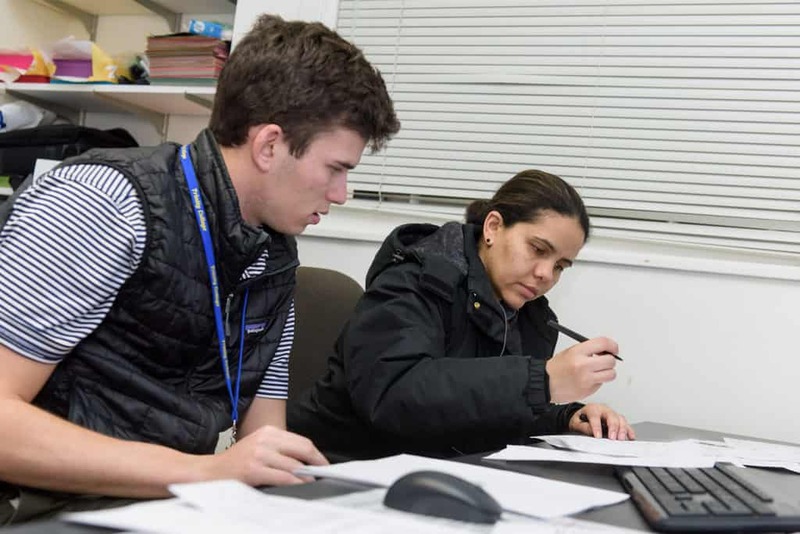 Visiting Lecturer in Political Science Serena Laws (center) and Alex Tomcho ’19 (right) assist a Hartford resident with his income tax return at Trinfo.Cafe. Photos by Nick Caito. Trinity students enrolled in the “Tax Policy and Inequality in Hartford” course taught by Laws take a two-day training seminar over a weekend to become certified VITA volunteers. “They learn how to use the software and to work in the tax clinic. They are not public accountants but can handle basic tax preparation,” Laws said. She added that students in her Trinity class learn about tax preparation and also understand greater issues surrounding tax policies and social inequality. “The class meets once a week and the clinic is open twice a week,” Laws said. “The course is set up so that students are doing this very experiential learning. They spend six to seven hours a week doing tax preparation, and then we have a weekly seminar on Fridays to debrief what’s going on, give practical tips, but then also do academic reading so they can contextualize what they are learning in this practical way to academic literature.” Topics include the history, use, and desirability of tax credits for social policy reasons. Tommy Peduto ’21 (left) works with a Hartford resident on an income tax return at Trinfo.Cafe. Mary Meza Celis ’22 wanted to try something new and took this class to gain valuable and practical experience. “The class is in a different field than what I am used to, as I am studying environmental science, and I wanted to explore fields outside of my intended major. Also, tax preparation is useful to know before you enter the adult world,” Meza said. Meza also said that in addition to teaching how to do taxes, the course teaches about relevant government policies and greater social issues. “Learning about how certain government laws are changing, who that benefits and how, has been really interesting. For example, the government does not always advertise tax credits or programs, so not a lot of people are aware of their refunds, benefits, or deductions. I’m learning the behind-the-scenes of these issues by taking this course,” said Meza, who also works at Trinfo.Cafe. Based on the success of this year’s pilot program, Laws hopes to expand the clinic. “This pilot program is a small-scale version of what we hope to do in the future. And we’re hoping to have the funding to expand,” she said. 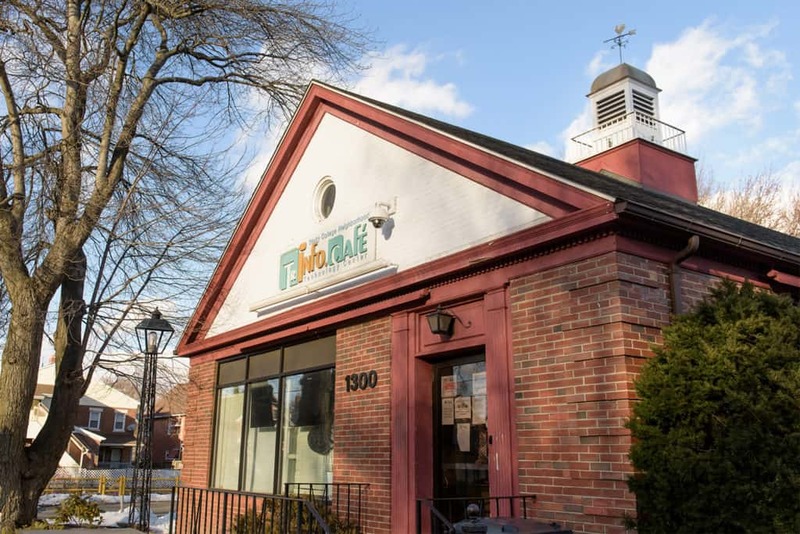 The Trinity VITA Tax Clinic at Trinfo.Café—located at 1300 Broad Street—is open Mondays from 11:00 a.m. to 3:00 p.m. and Fridays from 10:00 a.m. to 1:00 p.m. through April 15, 2019. Appointments (in English or Spanish) can be made by calling United Way’s 2-1-1 line or through the website 211ct.org. 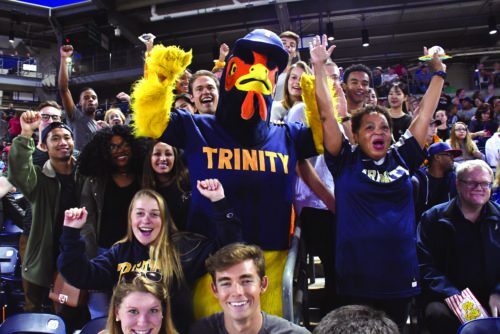 Read more stories about Trinity Pride.